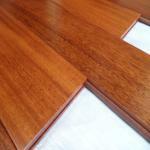 Iroko is big tree grown up from west coast of Africa Tropical areas,this wood has alternative commercial name African teak although it has no relation with Genuine Asian Teak(Tectona Grandis). 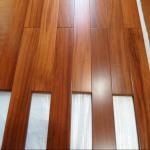 Natural prefinished Iroko(African Teak) timber flooring Acacia flooring usually exhibit visible beautiful golden strips,more importantly,this wood dent & wear resistance is much higher than traditional oaks,therefore Iroko wood flooring becomes very popular not only in China but also many other countries in Europe for residential use. 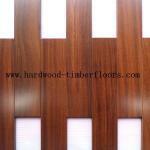 Random length wide board: 450-1200x122x18mm/pcs etc. 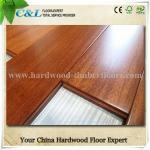 C&L hardwood supply Premier Clear Grade Iroko timber flooring which has very little flaws on its surface.The raw wood has been properply dried before processing on machines,normally the humidity is controlled under 12%. The hardwood board surface coating is applied by 8 layers primer finish,4 layers top finish.The top finish we use germany treffert aluminium oxide UV coating which greatly enhanced the scratch resistance of the timber flooring.On the other hand, board six sides are sealed by a layer of PU finish to increase the dampness resistance. Warranties: The Iroko 18mm solid floor from C&L hardwood in China is garanteed with 25years residential use under proper maintaince,the surface coating is provided with 7 years wear through warranty.